The global Kaposi sarcoma (KS) market is extremely consolidated with the top two players accounting for a combined share of almost 50% in 2015, finds Transparency Market Research (TMR). These companies are Johnson & Johnson and Merck & Co. Inc. Currently, the share of regional vendors, such as Sun Pharmaceutical Industries Limited, is noticeably low; however, in the coming years, their regional shares are anticipated to augment considerably, notes TMR. Owing to the large-scale patent expiry of numerous blockbuster drugs, particularly in the U.S., the market will expectedly witness several new entrants in the coming years. A significant number of these companies will be focusing on developing generics, unlocking a wealth of opportunities for leading drug makers. Key strategies adopted by companies include partnerships and acquisitions; several market players are collaborating with prominent companies for developing new products with enhanced efficacy. The global Kaposi sarcoma market is anticipated to expand at a modest CAGR of 2.2% from 2016 to 2024. The market stood at US$118.5 mn in 2015 and is expected to reach US$143.2 mn by 2024. Geographically, the major regional markets for Kaposi sarcoma are Europe, North America, Asia Pacific, the Middle East & Africa (MEA), and Latin America. Of these, the Middle East and Africa market is projected to exhibit the most promising growth. The substantial demand for Kaposi sarcoma therapies is driven by its high prevalence and the increasing incidence of AIDS-induced Kaposi sarcoma in many parts of Eastern Africa. 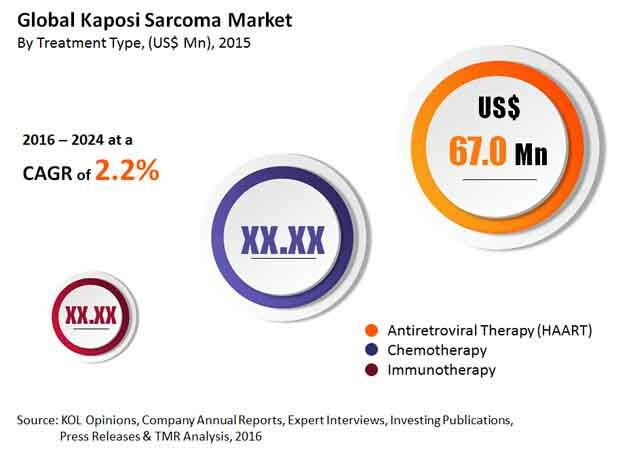 Based on treatment method, the Kaposi sarcoma market is segmented into antiretroviral therapy, immunotherapy, and chemotherapy. Of these, the chemotherapy segment is expected to rise at a strong CAGR over the forecast period. The growing popularity of the treatment protocol is driven by its increased efficacy to contain cancer that has spread to multiple areas of the patient’s body. The treatment is also found to be effective in improving the quality of life in patients with classic or endemic Kaposi sarcoma. Since Kaposi sarcoma is one of the most common AIDS-defining malignancies, the increasing number of people who are HIV-positive has increased the incidence of AIDS-associated Kaposi sarcoma. The increasing efficiency of highly active antiretroviral therapy (HAART) in the treatment of epidemic or AIDS-related KS has boosted the growth of the market. The popularity of antiretroviral therapy (ART) as the key treatment modality to improve overall health and survival rate among AIDS-related KS is expected to fuel the market. The increasing rate of organ transplant procedures has increased the vulnerability of patients to Kaposi sarcoma cancer. This is another crucial factor driving the Kaposi sarcoma market in various regions. The rising incidence of Kaposi sarcoma associated herpesvirus (KSHV) infection among patients who have undergone organ transplants is expected to spur the demand for KS treatments. However, the high cost of patented cancer drugs restrains patients especially in low- and middle-income countries to avail treatments, thereby hindering the growth of the market to an extent. On the other hand, the expected arrival of several generics and the soaring preference for chemo drugs among immunocompetent patients are expected to fuel the market over the forecast period. In addition, advancement in specific biomarkers in diagnosing KS is expected to open up lucrative market in the coming years.